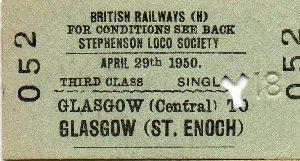 (1) Shed visits made at Balornock and Parkhead. (2) Route confirmation required. Reversal points not shown. Train departed from Glasgow Central at approx. 2.45pm and was reported to have run as planned. From The John Debens Ticket Collection.